Mass wasting is the movement of soil, rock and regolith (the loose dust and other material that covers rock) downslope because of the force of gravity. It can be slow and imperceptible, or it can be abrupt and violent. Because the Earth's surface is constantly changing, with mountains rising higher because of forces within the Earth, mass wasting is always taking place. If the height of a mountain or hill never changed, once all of the debris at the top fell to the bottom, mass wasting would stop. When mass wasting occurs rapidly, it is sometimes called a landslide. Mass wasting follows weathering, the breaking up of rock by mechanical or chemical means. After weathering creates debris, mass wasting moves the debris downslope. While both mass wasting and erosion involve the movement of debris from one place to another, erosion requires a medium, such as wind, water or glacial ice, to transport the debris. Mass wasting does not. Instead, mass wasting requires an event, known as a trigger. Mass wasting occurs in places where slopes have weakened progressively. However, until a trigger occurs, inertia continues to hold the materials on the slope in place. The trigger causes gravity to become stronger than inertia, and mass wasting begins. Earthquakes can cause dramatic mass wasting events. Earthquakes and their aftershocks can dislodge enormous amounts of rocks and debris. Heavy rains and large snowmelts can saturate debris on the surface of a hill or mountain, destroying the cohesive forces between particles. With nothing holding the particles together, gravity is free to pull them downslope. The weight of the water itself adds to the weight of the material, thus increasing the force of gravity. 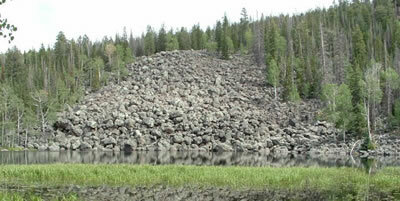 Mass wasting can occur when the freezing and thawing of water moves rock. The leaves of plants shield soil from rain, while their roots hold soil together. When vegetation is removed, whether by fire or by human activity, there is less protection from erosion. This increases the risk of mass wasting. If a slope becomes too sleep, mass wasting will occur. The steepest angle at which particles can remain stable along a slope is known as the angle of repose. If the angle of the slope increases so that it is greater than the angle of repose, particles will move downslope to achieve a stable position once more. Oversteepening can occur when a stream undercuts the wall of a valley or when waves pound against the base of a cliff. Human activity can also cause a slope to become too steep. Mass wasting events can be falls, slides or flows. During a fall, individual detached pieces of debris fall down the side of slope. Falls often happen when slopes have become too steep. They can occur when the movement of plant roots or the freezing and thawing of water loosens rock. Rockfalls occurs when a small number of rocks break off from a steep slope and then move quickly down the slope. They occur unexpectedly and can be very dangerous. In a slide, particles tend to stay together, moving a long a well-defined surface. In a rockslide, chunks of rock break off from the side of a slope and slide downward along a plane of weakness, such as a fracture or a layer of sedimentary rock, that runs parallel to the slope. Sometimes, during a rockslide, the entire side of a mountain can break off. A rock avalanche takes place when, during a rock fall, rocks hit the slope and break apart into thousands of smaller rocks, which then slide downslope. Rock avalanches move very fast and can be very destructive, causing loss of life and property. During a debris slide, the material that moves downslope consists mostly of soil and regolith. A slump is a type of slide in which material moves slowly, along a curved surface. Slumps occur when the base of a slope is removed, so that the upper part of the slope is no longer supported. This causes the material on the slope to move downward, forming a curved shape. Water erosion can cause slump, as can human construction. Slumps usually occur on slopes covered with thick, cohesive materials, such as clay. Flows occur when water saturates material, and the saturated material then moves downslope as a viscous liquid. In a debris flow, saturated soil and regolith move downward, usually along stream channels or valleys. A debris flow moves quickly and is very dense. It can destroy anything in its path. A mudflow is a debris flow in which the debris consists of fine-grained material. A debris flow that takes place on a volcano is known as a lahar. It consists mostly of volcanic material. Earthflows take place along the sides of hills in humid regions, when there is a lot of rain or snowmelt. Water causes particles of clay- or silt-rich soil to break away and move downslope very slowly. Liquefaction is a type of earthflow that takes place during an earthquake. During liquefaction, the movement of the earth shakes up saturated sand or clay, causing it to lose its cohesion. Liquefaction can make buildings tip over or sink. Solifluction takes place in the tundra, where soil contains an active layer on top of permafrost, a layer of soil that is always frozen. The active top layer freezes in winter and thaws in summer. During the summer, when water enters the active layer, it cannot percolate downward into the permafrost. When the active layer becomes saturated, it begins to flow. Solifluction takes place very slowly. Creep is the slowest type of flow. With creep, soil and regolith move downhill very gradually. Creep can be caused by the surface expanding and contracting as it repeatedly heats and cools, wets and dries, or freezes and thaws. Anything that disturbs the soil, such as burrowing animals or plant roots, can contribute to creep. Although creep is so slow it cannot be seen, it can cause walls to be displaced and poles and fences to tilt.